Ashwin Madia is a trial lawyer. He is grateful for the opportunity he has to fight for justice on behalf of individuals going through hard times against some of the largest corporations in the country. Ashwin began his legal career by fighting tough cases on behalf of some of the most desperate clients imaginable. As a law student at New York University School of Law, Ashwin advocated on behalf of battered women trying to find protection, unemployed workers trying to make ends meet, and immigrants seeking asylum from torture. 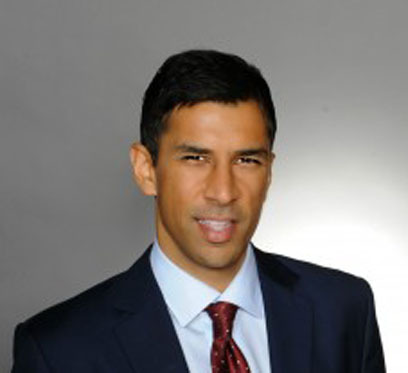 Ashwin also worked as a business litigator and gained experience in complex business litigation at two of the best litigation firms in the country – Faegre & Benson LLP (Now Faegre Baker Daniels) and Robins, Kaplan, Miller & Ciresi LLP. After graduating from law school, Ashwin joined the U.S. Marine Corps and served as judge advocate. There is no better training ground for a trial lawyer – Ashwin tried over one-hundred felony and misdemeanor cases. He spent most of his time defending young Marines who had made bad mistakes and were facing many years in prison. Ashwin tried a great number of contested jury trials, obtaining exceptional results for his clients, including one of the first successful defenses of a Marine who was discriminated against based on sexual orientation. In 2005, Ashwin deployed to Iraq and worked with the State Department, Justice Department, United Nations, European Union, and Iraqi judges and attorneys to help establish the rule of law in Iraq. Ashwin served as a prosecutor when he returned from deployment in 2006 and gained even more trial experience, establishing guilt beyond a reasonable doubt in numerous jury trials. Ashwin joined Robins, Kaplan, Miller & Ciresi LLP as a business and intellectual property litigator after his time in the Marine Corps concluded. There, he gained experience representing corporations as large as Honeywell, General Electric, and US Bank and as small as mom and pop storefront businesses. After running for Congress in 2008, Ashwin started Madia Law LLC because he believes in the rights of individuals to have a tough advocate in their corner against powerful interests. Since opening the firm, Ashwin has been humbled and honored to represent some of the most decent people he’s ever met, and to win fights on behalf of people who have suffered disability discrimination, racial discrimination, retaliation, sexual orientation discrimination, sexual harassment, age discrimination, and excessive force. Pension Plan and ERISA Litigation.